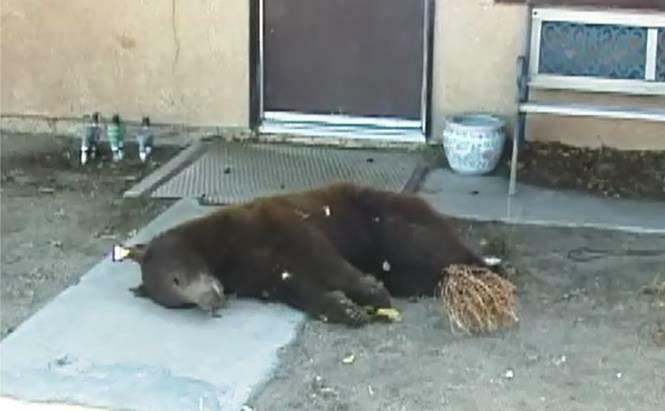 LITTLEROCK – The young male bear that made headlines last week for wandering through a Baldwin Park neighborhood was found dead just outside the front door of a Littlerock home this morning, authorities said. Officials received the call around 11 a.m. from a home near East Avenue U-5 and 86th Street East in Littlerock. A man inside the home told deputies that one of his neighbors called him and told him there was a bear on his front porch. “I looked out the window and I seen it and I called the cops,” the man said. Fish and Wildlife officials soon responded to the scene. Hughan said the department was familiar with the bear, having had a previous encounter just last week. After authorities spotted the bear roaming around a Baldwin Park neighborhood early Friday morning (Oct. 11), the bear was tranquilized, loaded into a pickup truck and released deep into the Angeles National Forest, according to the LA Times. The California Department of Fish and Wildlife has published tips for respecting and protecting wild animals. For more information, visit http://www.dfg.ca.gov/keepmewild/bear.html. 10 comments for "Bear found dead in front of local home"
Another hit and run victim. This large animal had to have damaged the vehicle that hit it. Stop hitting and running folks, take responsibility for your actions, even if it was ‘just’ an animal that ran in front of your vehicle. Stop being cowardly. How many people are going to stop when they hit a bear? Especially one thats nearly 300 lbs? The caption for the picture should be corrected if the story is right. Baldwin Hills and Baldwin Park are not the same place or even near each other. You are right. We made the correction. Thanks for the catch! So sad! He was just trying to survive. If this bear was captured in Baldwin Park Friday morning how did he end up 81 miles away in just four days? Just trying to get enough food to hibernate, damn that’s sad.